Haitian president Jovenel Moise did a serious clean up around him by getting rid of his Chief of Staff Wilson Laleau and his Secretaire Generale Yves Germain Joseph whose names are linked to PetroCaribe. 16 other known cabinet members including Ardouin Zéphirin and Guichard Doré are dismissed. 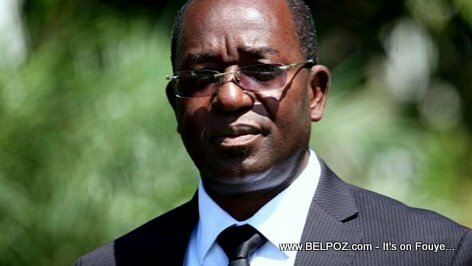 In a presidential order (arrêté presidentiel) dated October 22, 2018, President Jovenel Moïse chose businessman Nahomme Dorvil as Chief of Staff. Dorvil replaces Wilson Laleau. Jean Hilbert Lebrun is the new Secretary General of the Presidency to replace Yves Germain Joseph. 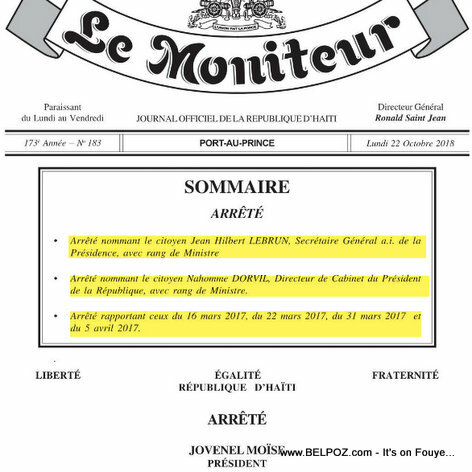 The Decrees appointing special advisers Ardouin Zéphirin, Guichard Doré, Christine Coupet Jacques, Liné Balthazar, Marie Esther Antoine, Reynold Georges, Enold Joseph, Gerd Pasquet, Joseph Jose Joseph, Erns Excéus have been reported and for the moment they are not replaced. Councilors Jean Renel Sanon, Everson Calixte, Guy Vincent Michel, Andris Riché, Georgera Stanley Lucas, Lucien Jura were also removed from their positions. According to lenouvelliste.com The new chief of staff will be able to recall some of them in his team if he so chooses. Haitian need to ask themselves why the country always has taken steps back when it should be forward. The answer is the United States. Anpil nan lot konseye yo ap rekondwi. Jovenel Moise debarase l de Wilson Laleau, Yves Germain Joseph.